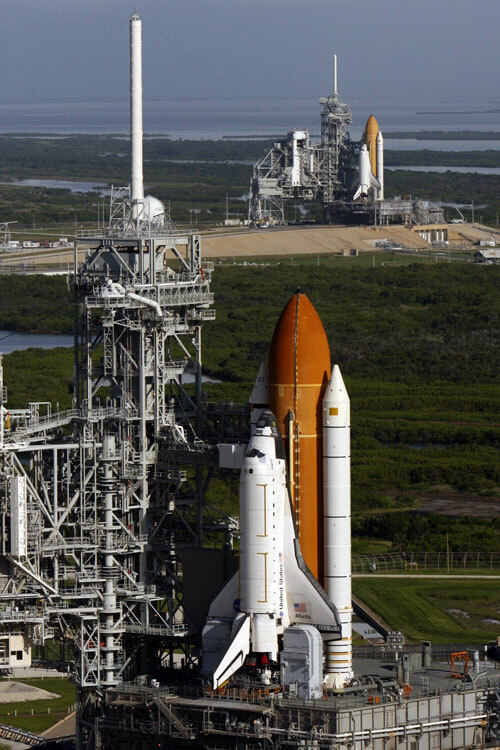 If all proceeds as now planned, two space shuttles — Atlantis and Endeavour — will be visible on launch pads 39A and 39B at NASA's Kennedy Space Center in Florida for approximately two hours on Saturday (Sept. 20, 2008). Endeavour, which will arrive at 39B on Friday, is being readied as a rescue vehicle for Atlantis, now on 39A, before flying its own mission in November. 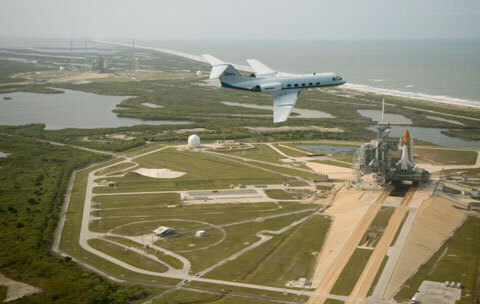 Atlantis' payload — instruments to upgrade and repair the Hubble Space Telescope — will arrive at 39A on Saturday evening to be installed in the orbiter's bay. 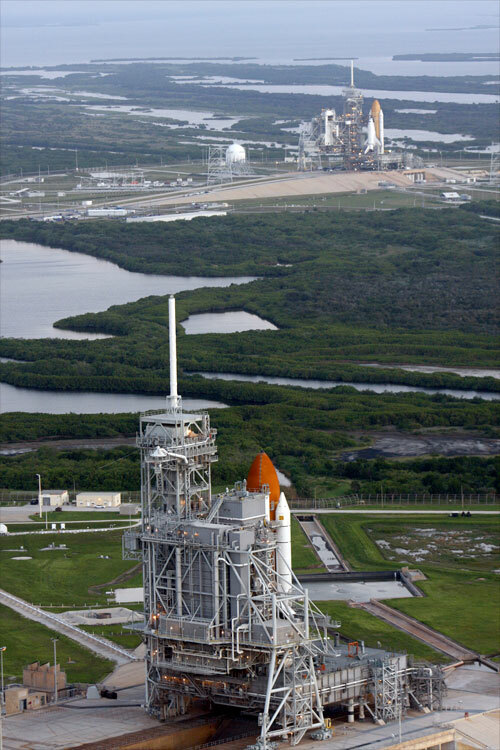 As currently scheduled, the two pads' rotating service structures will both be open from 7:00 to 9:00 a.m. EDT Saturday, allowing for a rare unobstructed view of the two shuttles on the two pads at the same time for what may well be the last time. 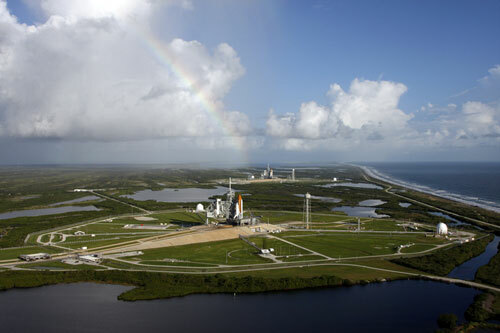 The following details when both pads have simultaneously hosted space shuttles. On September 20, NASA has invited the media to photograph both Atlantis and Endeavour on their respective pads with the rotating service structures rolled back from the vehicles. 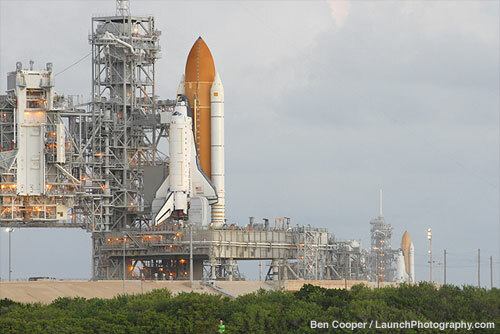 A live static shot of the two shuttles will be broadcast on NASA TV from 6:30 to 9:30 a.m. EDT. What a great sight that is. Wish I could see it for myself. 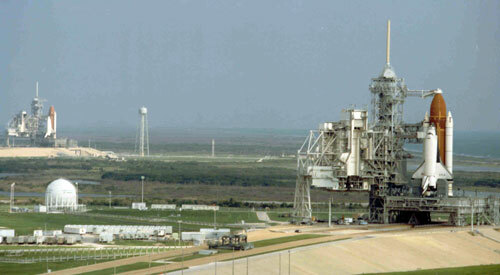 With both shuttles on the pad has the KSC tours been altered? 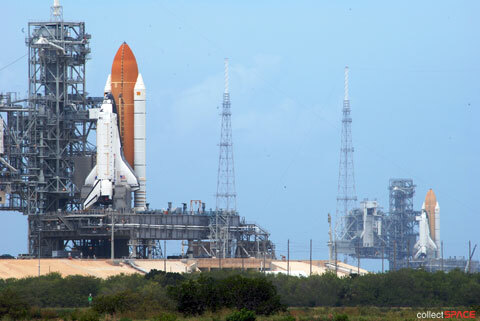 Specifically, the "Up Close" tour that went past the launch pads? According to a ticket sales agent, the tour has been modified. The buses no longer stop for the photo opportunity at the mound between the pads. You'll still see the pads but from inside the bus as you drive by them. Too bad the shuttle program never quite worked out as planned. That should have been a fairly common sight I guess. Nice to see though! I'm sure some of my fellow cSers wil think I deserve a firm slap for this, but... I can't believe I'm only one who thought of Bruce Willis when I saw these. Seriously, though... awesome pics. Too bad this wasn't a more frequently-seen sight. Actually I was thinking the same thing myself although I didn't have Bruce Willis himself in my head. But, the image from Armageddon of two shuttles on the pads still hangs in my head as well. I did manage to SIM a simultaneous launch of two shuttles in the Orbiter freeware simulator with one of the downloads from more accurate shuttles (with an autopilot). It needs a computer with a fair amount of power to do (and lags will kill it as one won't reach orbit). But when pulled off successfully with but shuttles reaching orbit, it looks awsome! 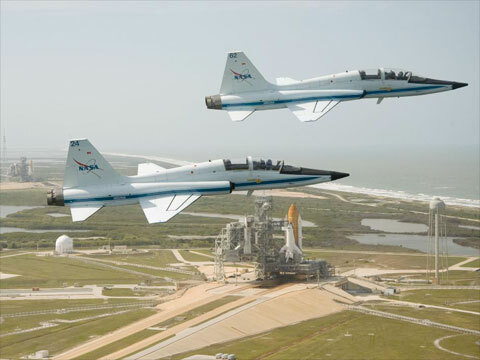 For what may be only the fourth time in history, two space shuttles sat exposed on NASA's two launch pads at the Kennedy Space Center in Florida this weekend. The rare sight came to a close today, as each was covered by rotating sections of their pads' structures. 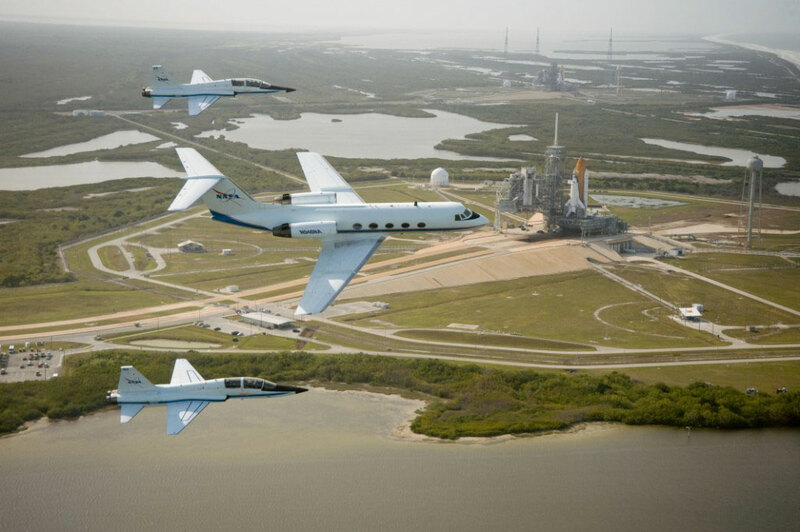 As spectacular as it may have been, NASA hopes it'll be the last such simultaneous view for the shuttles, although they have had that expectation before. Robert, what a great picture! Imagine what might have been if the shuttle was more reliable and less expensive to place payload into orbit? If so then this scenario might be just another day at KSC. Just curious, does anyone know of a photo of 3 shuttles? Just curious, does anyone know of a photo of 3 shuttles? There are only two shuttle launch pads (39A and B) so there can only be two on the pad at the same time. I understand there are only 2 launch pads. I was just curious if 3 orbiters were ever near one another such that they could be photographed at one time. Unlikely I suppose, but just curious. 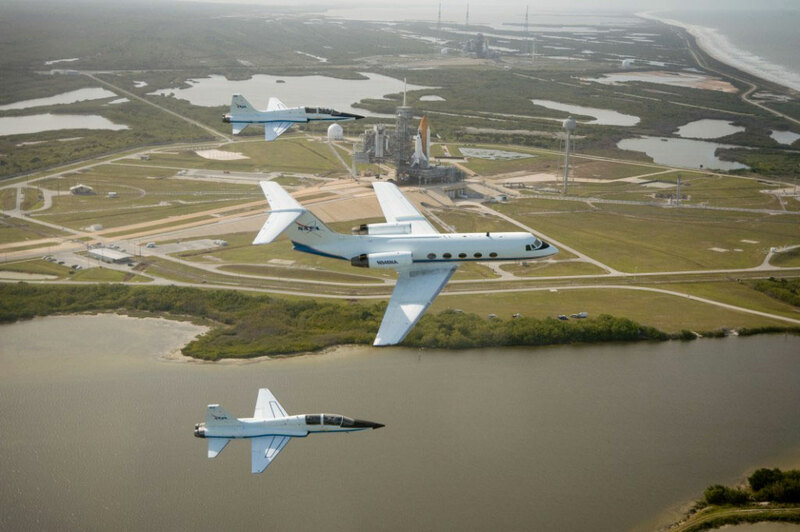 It certainly would be nice if all three orbiters could be lined up at the shuttle landing facility following the final mission for a photo opportunity. Perhaps invite every flown shuttle astronaut to pose for a group photo in front of the orbiters before they are dispersed to museums for final display. That's a great idea. It might give people a better idea of the scope of the program. Put Story Musgrave in the front as the only astronaut to have flown on every space shuttle. Great photo but what a waste having those empty back seats! GREAT PHOTOS! 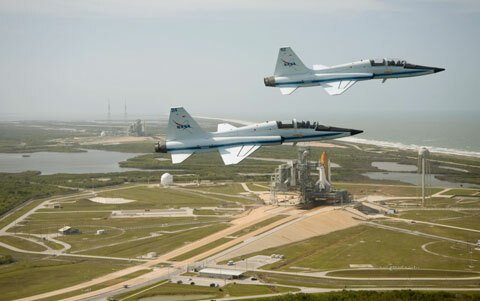 Oh, and the T-38s and shuttles look cool too. 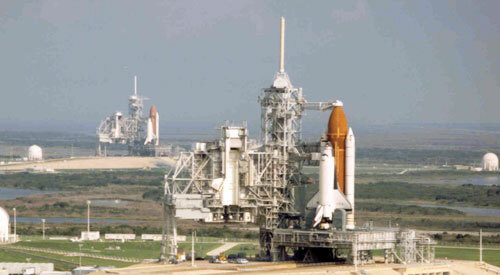 Seeing two space shuttles on the launch pads is a treat in itself! What a sight! Is there video footage of a shuttle taking off with the other shuttle in the background or foreground? I have seen some but the other shuttle always has the RSS around it. It almost looks like there might be a chance for Atlantis and Ares I-X. 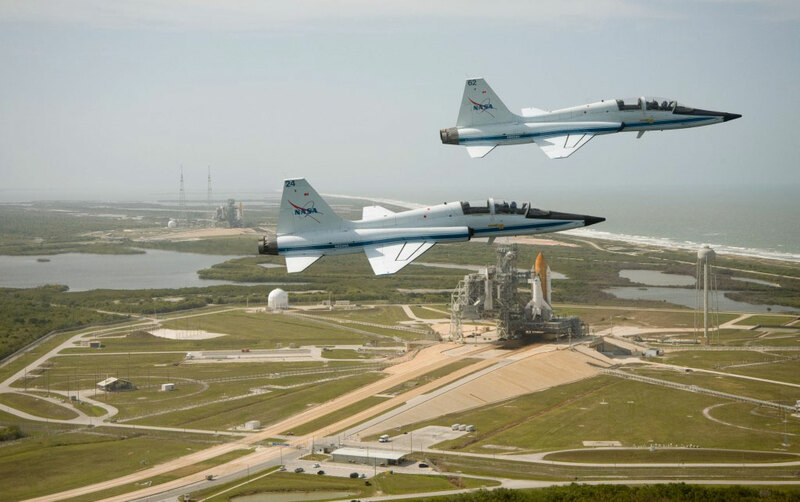 Mission Specialist Kathryn Sullivan's camera skills show that the view of Launch Pads 39A and B from a T-38 trainer is unforgettable. Sullivan took the pictures as she and fellow Space Shuttle mission STS 31 crew members flew into KSC on April 22. 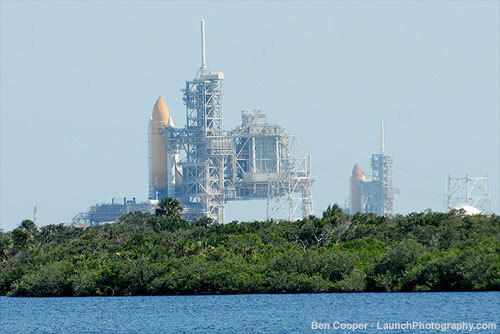 STS 31 is set to lift off from Pad A at 8:31 a.m. on April 24.